← Fact and Opinion in the News. The military justice system demands justice for our troops, not revenge upon them to curry favor with others. 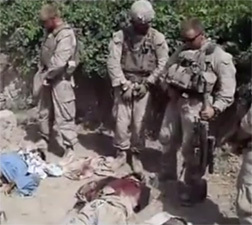 The video of U.S. Marines who apparently urinated on Taliban corpses has gone viral and not only the Islamic world is watching. Odds are the young men in this film will be strung up by military authorities. They will be treated like political road kill. Expect them to stuck in a military brig right next to Bradley Manning, and to be presumed guilty by the commanders who told them to run headlong into the arms of death. We will sacrifice them to make ourselves feel better. The soldiers will be prosecuted. Their trial should be public. A key question at trial will be the matter of selective prosecution. Were these men prosecuted for what they did, or because there is a public record of what took place? I suspect it is the latter, and that we hypocrites don’t mind a little desecration in the service of military necessity. We just don’t want to be forced to watch it. Open the records. Tell us this never happened before; that it is unprecedented. We all know better. We know war is hell, and those who survive are singed forever by hellfire. Do we really think Miss Manners should serve as a drill instructor? Many people are calling for blood. They want the President and Secretary Panetta to summarily sentence the Marines to life in prison for war crimes or try them at the Hague. I hope and think that Eric is right and that it won’t happen for the reasons stated below. If tried by courts martial the courts will be composed of Marines, many of whom have been in combat, wounded and seen their comrades fall. They likely know what combat and its immediate aftermath are like and will judge accordingly. That things could possibly turn out differently doesn’t much worry me much because I don’t think they will. The political motivations and passions now becoming evident do bother me. That, or less, seems adequate and punishment under Article 15 does not carry the often life-long stigma of conviction of a federal offense by general or special court martial. The only “logical” basis I can imagine for proceeding differently against these Marines than a sensible commander of Colonel West’s caliber would might be a perceived need to demonstrate to our enemies — who do far more reprehensible things to convert living Americans into corpses and in the process or shortly thereafter to “desecrate” their bodies horribly — that the United States is “exceptional” and therefore entitled to their respect and approbation. That tactic has been successful during recent years in appeasing some Liberals Libruls at home, but far less successful in mollifying our enemies abroad. It has encouraged what seems to be an increasingly justified sense that we are weak. Nor is it likely to work in our best interests any better now than in the past. As I observed here, our foreign policy often leaves much to be desired. How should our military justice system respond? I have long been proud of our military criminal justice system, probably because I was privileged to be a very small part of it as a young Army JAG captain between 1966 and 1970. In retrospect, that was the most professionally satisfying part of the legal career from which I retired in 1996. After serving as a prosecutor for the command in Seoul, Korea exercising general court jurisdiction, and prosecuting enough cases well enough to be deemed reasonably competent in trial work, I was assigned to do defense work. Later, since I was by then the senior captain in the office, I became the chief of military justice for that command when an unanticipated vacancy occurred. During my next tour of duty, I was one of many JAG counsel appearing before the Army Court of Military Review (later the Army Court of Criminal Appeals) and U.S. Court of Military Appeals (later the U.S. Court of Appeals for the Armed Forces) in Washington. When the Congress amended the Uniform Code of Military Justice (UCMJ) to make special courts martial more closely resemble general courts martial, I was sent to the Army JAG school in Charlottesville, Virginia to study and then to become among the first special court martial military judges. Upon graduation, I was again assigned to Korea where I presided over approximately three hundred special courts martial. We were told at the JAG School that high ranking officers, including some of flag rank, had been relieved of their commands for exercising command influence. Although some of my decisions very probably irked some commanders, none of them made any effort to communicate their displeasure to me or otherwise to suggest that I had screwed up, that I should change my ways or anything else. In sensitive cases, justice has become politicized. The Obama Administration referred to the November 5, 2009 attack by Major Hassan at Fort Hood, Texas as workplace violence rather than as terrorism or any other species of Islamic Jihad. Presumably, the administration deemed that appropriate as a matter of foreign policy, to avoid giving offense to Islamic countries. The administration should have remained silent. Fortunately, Major Hassan has finally been scheduled for trial by general court martial commencing in March of this year and could be sentenced to death; he should be. 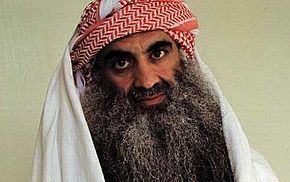 Khalid Sheikh Mohammed (KSM), the alleged “principal architect” of the September 11, 2001 massacres at the World Trade Center and elsewhere, captured on March 1, 2003, has yet to be tried. On 1 February 2010 White House spokesman Robert Gibbs told CNN that “Khalid Sheikh Mohammed is going to meet justice and he’s going to meet his maker. 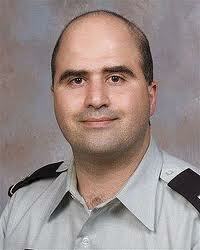 He will be brought to justice and he’s likely to be executed for the heinous crimes he committed”. The White House spokesperson’s statement has been criticized as violating the principle of the presumption of innocence and has been characterized as egregious by an attorney of Guantanamo Bay detainees. On 4 April 2011 Attorney General Eric Holder announced that Khalid Sheikh Mohammed and four other 9/11 terror suspects will face a military trial at the Guantanamo Bay detention facility. In announcing his decision, Holder was highly critical of Congress for imposing restrictions on the Justice Department’s ability to bring the men to New York for civilian trials. My views concerning a civilian trial of KSM and others like him are expressed here and here. Such trials would very likely become publicity circuses; that happened before and it seems reasonable to expect the same for future such trials. The same should not happen for military trials. The manner in which the offenses of Major Hassan and KSM were initially treated is relevant to how the unfortunately absurd videotaped actions of the Marines have been and conceivably might in the future be treated. The offenses of Major Hassan and KSM were in many respect treated as political matters, to garner favor (or at least to minimize disfavor) with some in the United States and in foreign countries. That’s bad. To subject the Marines to different forms of prosecution than would have been used if they had not stupidly gained international notice by calling attention to themselves would deviate perversely from the sort of military justice we have generally had and to which we should still aspire. Justice has no proper function of demonstrating to our enemies, or even to the rest of the world, how “exceptionally” interested we are in appeasing and being loved by our enemies — and by doing so how perverse our systems of justice can become. I have faith based on my own experiences with military justice that that will not happen here, and certainly hope that it won’t. This entry was posted in Appeasement, Army, Clinton, Freedom, History, Ideology, Islamic rage, JAG, Judges, Justice, Korea, Law, Marines, Military, Military justice, Obama, Opinion, Politics, Religion, Torture, United States, Urination and tagged leon panetta, military authorities, military justice system, selective prosecution. Bookmark the permalink. 14 Responses to Should politics and foreign policy affect our military justice system? Pingback: What happens after Korans are burned in Afghanistan? Pingback: Opinion Forum » What Happens After Korans Are Burned in Afghanistan? What you quoted for punishments may be what they did when you were JAG, today they more than likely will get 10 years in Leavenworth, and many already have for lesser reasons. Michael Behenna, Corry Clagart, and over 110 others are imprisoned for doing their job of war, period. In this politically correct, islamist appeasing military leadership, these POW’s need justice by those who have the expertize. The current JAG core is, if possible, more corrupt than the politicians in DC and local government….sorry for the rant, but knowing the stories of these young men and the reasons for their POW status just sets me off. Col. Allen West has vowed to get to the bottom of it, but so far, he seems to be the only one. You may be correct. It’s been more years than I care to count so I can’t speak for the current JAG Corps, but will be very disappointed if that is the case. I wish Col. West would give serious consideration to seeking higher office. This seems timely in view of claims that those responsible for burning Korans will be “punished” and in view of demands that they be “punished.” We have an excellent system of military justice and it should not be disgraced by failing to follow it for political or other inane reasons. Thanks for the link to my post and for the information here about what the appropriate punishment should be under the The Manual for Courts Martial (MCM) I thought that it should be that sort of scale of sanction but not being from the USA I was only guessing. I will link back to your post . Many thanks, Iain. I appreciate it.